Member Spotlight - "Coffee Break Marketing" The Top Tools for Marketing Your Services! 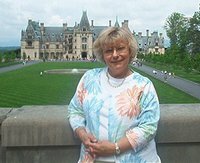 I am a founding consultant with Biltmore Inspirations, the direct selling division of the Biltmore Estate in Asheville, NC that launched July 1, 2011. We inspire families to celebrate every day with style by embracing the Biltmore legacy of gracious hospitality. What drives growth in your niche? My business is quite new but most people are familiar with the Biltmore Estate, the largest home in America, that’s a great lead in to begin a conversation. Our products are inspired by the Vanderbilt family, rooms, locations, & events on the Estate. We provide products for everyone to decorate their home with style & grace. Our Chef’s Choice Collection makes gracious entertaining a snap. What are a couple ways you’ve marketed you business offline and online? Online – I regularly post to social media sites, Email my customers & leads captioned photographs of product & food with links directly to my web site. I find that customers are attracted to a variety of pictures showing products used in an everyday setting, something they can envision doing in their own home or to give as gifts. With today’s busy lifestyle, everyone is looking for delicious, tried & true, mouthwatering meals easy to prepare & artfully served. The first few days of every month I send out an electronic newsletter containing articles, professional product photography, recipes, monthly specials, how to start your own entrepreneurial business. It contains links to my website to purchase, book a party, join my team or request more information. Offline – I network as much as possible by participating in a monthly lead generating groups. Each attendee has an opportunity to stand & present a business overview. Before & after we chat with attendees, share business cards & literature. Members support each other with referrals whenever possible; always keeping our ears open for verbal ques. I am always looking for volunteering opportunities to be a guest speaker anywhere my target audience may gather. Throughout the country are opportunities to set up eye-popping displays at large public events. The benefit is to reach a large number of potential customers at one time. Share product ideas, uses, track attendees interest with a customer service survey to gather Emails making specific notes of their particular interest useful when I phone them after the event. Business cards & product literature are always within arm’s reach to share. Stop by soon to find out who makes the grade next. If you’re interesting in having your firm or practice featured in our member spotlight, let us know what you’ve been up to.